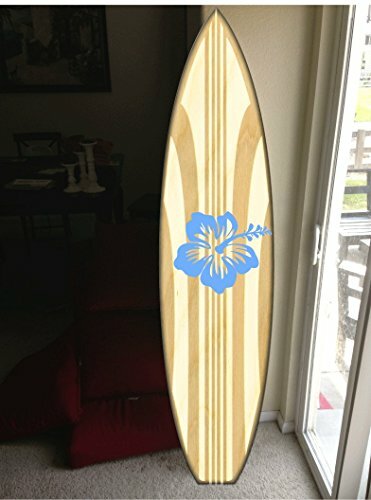 wall hanging surf board surfboard decor hawaiian beach surfing beach decor by Rad Grafix at Eny Theme. Hurry! Limited time offer. Offer valid only while supplies last. You are Purchasing ONE custom made themed surfboard decor... this shows 2 different options.. Let me know which one you like. Or customize your own. You are Purchasing ONE custom made themed surfboard decor... this shows 2 different options.. Let me know which one you like. Or customize your own. It is made of high quality 1/2" plywood painted and vinyl graphiced. I put 2 coats of gloss clear coat to give it a beautiful shine to it... Pick a name or saying to go on the board. This name can be changed to anything.. for custom work please contact me let me know what you want and i can list it and send you the link. I also send you a proof of your custom board before i even make it... the board itself is 60" long and 15" wide... If you have any creative ideas for a surfboard please let me know... Anything is possible. If you have any questions about this product by Rad Grafix, contact us by completing and submitting the form below. If you are looking for a specif part number, please include it with your message.